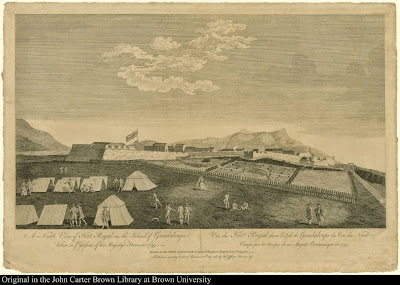 A North View of Fort Royal in the Island of Guadaloupe, when in Possession of his Majestys Forces in 1759, Lieutenant Archibald Campbell, 1764, John Carter Brown Library. This print is taken from a hand drawn sketch by Lieutenant Archibald Campbell of the Royal Engineers in 1759. 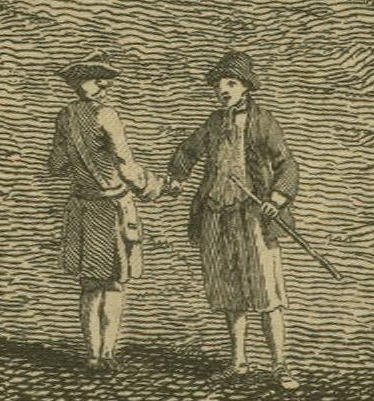 A later edition of this print is in the collection of the National Army Museum. According to their collection entry, Guadaloupe was a haven for the privateers that had long harassed the British in the Caribbean, and so became a prime target for the British efforts to defeat the French in the Seven Years War. Like many campaigns in the Caribbean, disease killed many, reducing British forces by hundreds of men. The sacrifice of the regulars ensured the reduction in privateer attacks that followed. Perhaps this is why Campbell decided to include a lobsterback and a tarpawlin shaking hands beside the road to Fort Royal. Jack Tar wears a short jacket that ends at about the top of his thigh. Beneath he wears his shirt and no waistcoat. Around his neck is a neckcloth of indeterminate pattern or color. We can say a bit more about his hat, which has a tall crown and rolled up brim. I'm inclined to say it is a knit cap or Dutch cap, rather than a round hat. His slops end just below the knee, revealing white stockings, and rounded square toed shoes. In his left hand he holds a walking stick.